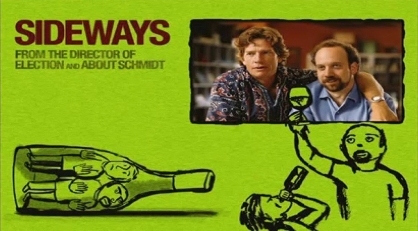 2019 is the 15th Anniversary of the release of the wine related movie “Sideways”, which follows two friends reaching middle age with unfulfilled lives embarking on a week-long road trip through California’s wine country, just as one is about to get married. There is a memorable scene in the movie in which the lead character played by Paul Giamatti, a Pinot Noir fan, adamantly refuses to drink Merlot – that sets the tone of the movie. A lot has changed in the wine industry in Santa Barbara since then, but we’ve managed to get enough of the wineries showcased in the movie for a tasting and thus will be drinking some fine Chardonnay, Pinot Noir and Syrah on Saturday, June 1 @ 7pm. Note, not the exact wines appearing in the movie will be in our tasting as several of them are no longer being made by the respective wineries. However, the Cali wineries represented are definitely in the movie. We’ll discuss the so-called “Sideways Effect” – the declined sales of Merlot and the upswing of Pinot Noir have become folklore within the wine industry. We can’t really do the ultra premium Chateau Cheval Blanc at the end of the movie (the cost of this event would be in the hundreds of dollars) for this said $1k bottling but we’ve searched high and low for a couple of wines to take its spot, including a 100% Merlot Bordeaux right across the way from Cheval Blanc to perhaps change the minds of the non-Merlot drinkers out there. Plus we’ll have plastic cups available for those who want to drink it ala in the movie! Don’t miss this totally fun stand-up event to bring back some memories and see how far Pinot and Merlot have gone in 15 years since the release of this Oscar winner.